Nannyberry viburnum. Photo courtesy of the Missouri Botanical Garden. They can be discovered throughout our native ecosystems— saskatoon serviceberries Amelanchier alnifolia peeking out at the edge of woodlands. The red, holly fruit-laden spikes of winterberries Ilex verticillata emerging from damp thickets, bordering streams and ponds. And on well-drained woodland slopes, the nannyberry Viburnum lentago with dense clumps of tiny white flowers, alive with bees and butterflies. Iowa’s native shrubs fill the middle tier of vegetation, blending together prairie and woodland ecosystems. They generate top-notch songbird habitat, and food for many species of wildlife. Some have edible fruit or nuts and impressive ornamental quality, making them multifunctional additions for gardens and urban forests. Perhaps you have had the pleasure of sampling a sensationally sour high bush cranberry Viburnum opulus var. americanum while hiking. 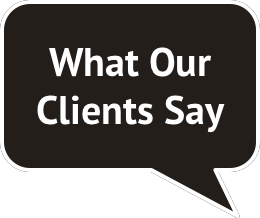 Maybe you’ve tasted antioxidant-rich preserves made from elderberries Sambucus canadensis. Many of Iowa’s native fruits and nuts are not only edible, but are tolerant to partial shade and poorly drained soil. This enables them to thrive in an ecological niche where many cultivated food plants cannot. 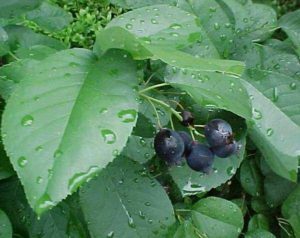 “Regent”, a variety of Alder-Leaved Serviceberry cultivated for berry production. Photo courtesy of the Missouri Botanical Garden. Buttonbush. Photo courtesy of the Missouri Botanical Garden. The fabulous, spiky orbs of buttonbush Cephalanthus occidentalis attract butterflies and other pollinators. Scarlet spikes of redosier dogwood Cornus sericea can light up a wintertime garden with brilliant color while functioning as a living snow fence. In addition, their clusters of ornamental berries attract and provide food for songbirds. 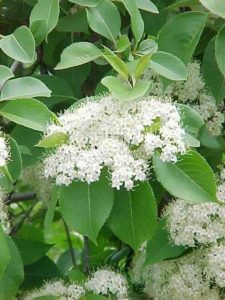 For a list of native shrubs (including natural habitats), check out the Iowa State University Forestry Extension publication “Trees and Shrubs Native in Iowa”. Additionally, the Missouri Botanical Garden website contains pictures, and an abundance of practical information about the zone, height, spread, sun and water preferences, edibility, and growing characteristics of most of Iowa’s native shrub species. If your shrubs are at risk of deer browse, place rigid plastic mesh protection tubes (3-4′ high) around them immediately after planting. Before ordering native shrubs, observe the soil drainage and sunlight characteristics of each site. If water tends to collect there, make sure to select a species that will thrive in moist soil. The height and spread can range from 3 to 20 feet, depending on species and growing conditions. Pruning may be an option to limit size. Irrigate after planting, and then as needed during the first year. Keep the area at their base free of weeds with mulch or an appropriate herbicide for three to five years, while the native shrubs get established. You can find high quality native shrubs at Iowa Native Trees and Shrubs in Woodward, IA or Kelly Tree Farm in Clarence, IA. The owners of these nurseries are full of knowledge to help you succeed in your shrub-growing endeavors. If you are doing a larger planting for wildlife habitat on a farm, acreage, or woodland, you may qualify to purchase from the Iowa Department of Natural Resources (DNR) State Forest Nursery, in Ames, IA. 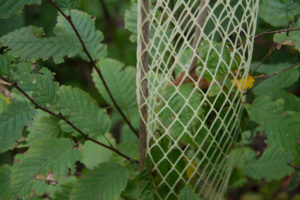 Within a few years of planting your native shrubs, you won’t have to go hiking in a remnant forest or riparian area to experience their stunning aesthetics, or to sample the puckering burst of flavor from Iowa’s wild edibles. Just a handful of flowering fruit or nut producing shrubs in your yard or woodland will grow into an incredible habitat contribution to support Iowa’s native pollinators, songbirds and other wildlife.